To me a book is a window into possibilities, people and customs that exist elsewhere –something that I would never have had an opportunity to knowing otherwise. So, when Rosy Thornton mailed me about reviewing her book, The Tapestry of Love, I was thrilled. I had never read a book based in the French countryside before.I fell in love with the book right from the minute I opened the package and set my eyes on the cover of the book: An old door painted white with splotches of greenery around it. The book starts languorously with Rosy describing the Transhumance, a bi-yearly ritual common to the mountain regions of France where sheep are herded up and down the slopes of the mountains depending on the time of the year.During the autumn transhumance sheep are herded from the grasslands in the mountains down the slopes to the valleys and during the spring transhumance the process is reversed. Catherine is a divorcee who moves to a hamlet in the Ce'vennes Mountains from London.She is an empty Nester with her children, Lexie and Tom grown up and busy with their own lives . She decides to start her own business as a seamstress in the idyllic rural environment. At the Ce'vennes, Catherine has to contend with loneliness, stiff neighbors and horrible weather. We are introduced to the Bouschets, Madame Volipere, the Merriels and Patrick Castagnol. Her neighbors are gracious and invite Catherine over for tea and meals , but their requests are formal. Catherine strikes up an easy friendship with Patrick as their conversations cover subjects as varied as bee-keeping, boars ,lepers and saints. As paragraph upon paragraph rolled by describing Catherine’s life, I could feel her loneliness myself. But the narrative is not depressing at any point.I loved Catherine’s character-strong and warm.Despite her divorce, she is not bitter about her husband seeing another woman . Catherine embraces her new life selling her cushion covers and upholstering furniture to the locals . Everything rolls by smoothly until her sister, Bryonne decides to visit her. Now, Bryonne is everything Catherine is not- perky and leads an extremely successful life as a partner in a London law firm.During Bryonne’s visit Catherine realizes that both of them are falling for the same man. But the man has secrets that he holds close to his heart himself. The rest of the story is about how Catherine befriends the neighbors, becomes an integral part of the neighborhood, how she strives to get her enterprise registered and makes sense of the feelings she has towards Patrick. The strong points of the book are the depth with which each character is etched out,Rosy’s lovely words and the information on life in the mountains. I particularly loved Lexie,the journalist daughter who tires of her writing jobs in a jiffy and constantly seeks something else to excite her. Somehow, the neighbors didn’t make much of an impression on me and I wonder if it was done on purpose.Rosy’s love for good food and the mountainside shows through the pages of the book. My only issue with the book was the length-400 odd pages.Somewhere in the middle the narrative sags a bit . I would have also wanted to learn more about the finer points of making tapestries.But things soon heat up and to know more you need to grab the book and read it :-). 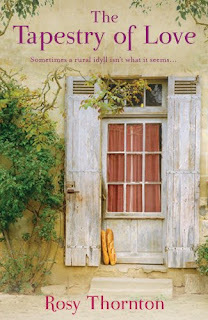 Overall, a simple love story set in a beautiful pastoral background. I’ll give it a 3.5 /5. I would recommend it to anyone who loves a good love story and am looking forward to reading more of her work. Thanks Rosy for sending me this book to review. A bit about the author: Rosy Thornton teaches at Cambridge University and lives with her daughters and partner in a village near the University. She also has three more books – More than Love Letters, Hearts and Minds and Crossed Wires to her credit. For more info hop over to Rosy's website here.You'll be pleasantly surprised to see a lot of traditional Ce'vennes recipes there. Share book reviews and ratings with Bedazzled, and even join a book club on Goodreads.